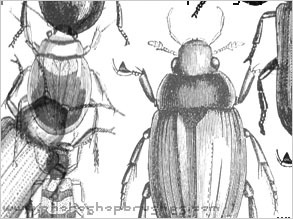 Another five Beetle Illustrations, these vary in size some being quite large and some are small. If you like these illustrations style brushes check out the Moth Illustration Brushes, Sea Creature Brushes and the new Floral Photoshop Brushes Illustrations page. There are also some vector Beetle Brushes on the Illustrator Brushes site, these are also free to download.